It's the end of September and the weather here in the UK has turned decidedly autumnal, with drizzly, misty days, gorgeous shades of reds and golds in the trees, and berries wherever you look. All very poetic! 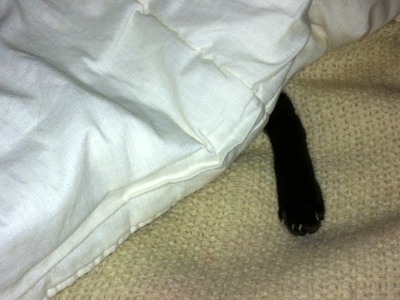 Bandit, who doesn't care much for poetry, thinks it's too cold already and has gone back to sleeping under his own personal duvet. This month we're talking, among other things, about the names people choose for their Siamese cats, and how they choose them. There's a question from our Doreen Tovey pages (Doreen herself had a good range of names for her Siamese cats) followed by our Meezers of the Month, who take their names from famous movie characters. And we round it all off with some preparations for 2018 (already?!) with a selection of delightful Siamese and other cat calendars for you to browse through. A request that often comes up in some of the groups and forums I belong to is for help in naming a new cat or kitten. I have a selection of pages here on the website with suggestions for names; the quote above is from the poem The Naming of Cats by T.S. Eliot, which itself contains some memorable ones! Another poet, Robert Southey, gave one of his cats possibly the longest name ever - "The Most Noble the Archduke Rumpelstiltskin, Marquis Macbum, Earl Tomemange, Baron Raticide, Waowler and Skaratchi". I don't know what the poor cat was called for short but I hope it was something simple, like Duke. When Bandit first arrived here he didn't have a name because he'd been a stray, so I spent four or five days trying out different ideas to find a name that fit his personality. And then one day he came into my office and announced (I swear this actually happened!) "my name is Bandit". So Bandit he became and over the years since then, through our own Facebook page and other groups, I've always enjoyed seeing the choices people make when naming their cats. Here are a just a very small selection of them. There are cats named after famous Romans (Caesar, Spartacus, Maximus) and Roman legends (Romulus and Remus), Greek gods and goddesses (Zeus, Apollo, Aphrodite, Persephone) Egyptians (Horus, Anubis, Cleopatra, Isis, Ra), Norse gods (Loki, Odin, Freya, Thor), and biblical names (Solomon and Sheba). Then there are the cats called after book or movie or TV characters. Recently these have included Game of Thrones characters (Arya, Sansa, Tyrion and Jon Snow are all popular) as well as older, typically Siamese ones like Tao from The Incredible Journey, DC from That Darn Cat, Skippy (Skippyjon Jones) and Sagwa (The Chinese Siamese Cat). Hobbits (Frodo, Bilbo, Merry, Pippin) and their companions from Lord of the Rings (Strider, Arwen, Elrond) get a look in too, although I don't think anyone has yet called their cat Gollum! And the wizards and witches ... Gandalf, Dumbledore, Merlin and Hermione among them, and Eastern-sounding names are, as you would expect, always well-loved (Mei-Ling, Chang, Ming, Fu, Chula, Lili, Lulu, Qiqi, Maio). "Have you ever heard the old African proverb that says,'It takes a village to raise a child'? But what happens if that child is forty years old? Elizabeth Menier is suddenly alone in the world after the death of her domineering mother, and over the course of twelve months everything she thinks she knows is challenged. Through the people around her and a series of shocking events, she begins to find her undiscovered self." 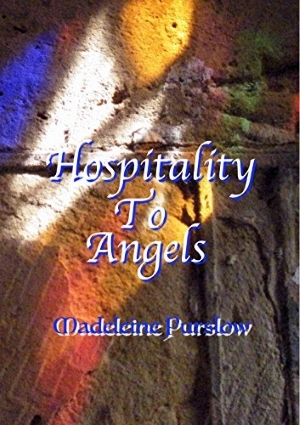 At the end of last month I mentioned that I'd just bought Madeleine Purslow's latest novel, Hospitality to Angels, and promised to review it for you this time around. Maddie, for those of you who don't already know of her, lives with four Siamese and Oriental cats of her own, and one of the dedications in Hospitality to Angels is to her now deceased and much missed Queen Theda. Hospitality to Angels isn't a follow-up to Maddie's previous novel Moon Diamonds, but it does also have a Siamese cat in it! This time, it's a four-year-old chocolate point called Lawrence, who's given a new home by Elizabeth (the novel's main character) after the death of his former owner, who named him after Lawrence of Arabia. Lawrence has a pivotal role to play in the story, which takes place over the course of an important year in Elizabeth's life. I wrote a review for the book on Amazon UK, so I'll start by saying what I said there - that I loved this book from the first page to the last, and stayed up way too late one night to finish it. There are some great characters in it, together with a perfect depiction of an English village where everyone knows everyone else (and everyone else's business, too.) The story tugs at your heartstrings as you follow Elizabeth through moments of humor and sadness as she struggles to reinvent herself after a lifetime spent in her mother's shadow. And without giving too much away, you find yourself cheering her on when she eventually breaks free. Question: When is a Siamese cat not a Siamese cat? 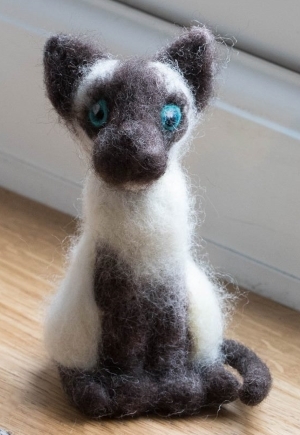 Answer: When it's a needle felt Siamese cat! The delightful kitty above was made for me by a friend, Carol Leather, who, among her many other talents, is a skilled needle worker and crafter. One day while she was experimenting with needle felt animals (you can see some of them here on her own website, Needlework Tips and Techniques) I asked her if she'd make me a Siamese cat and this was the result. He's ever-so-cute, and has the same slightly bewildered look that Bandit had before we adopted him. His name is Benji (he told me this too!) and he's sitting on my desk looking at me as I type. My mascot! Carol doesn't yet sell her lovely animals commercially, but if you're interested in finding out more about them you can contact her through her website. Incidentally, Carol's also an excellent wildlife photographer and you can follow her work in that particular field over on her Facebook page. Earlier this month New Zealand author Lyn McConchie, who had a long correspondence with the much-loved and much-missed Doreen Tovey over the years, asked a question on this page created by Caz Greenham, herself an author and a cousin of Doreen's. "Does anyone know who inherited the copyrights to Doreen's books?" After some discussion in the comments it seems that Doreen left her copyright to a couple of charities (one feline, one medical) but it's unclear who the current copyright holders are. If you happen to know the answer, please send me a note through our Contact Form, or leave a comment on the page linked to above. 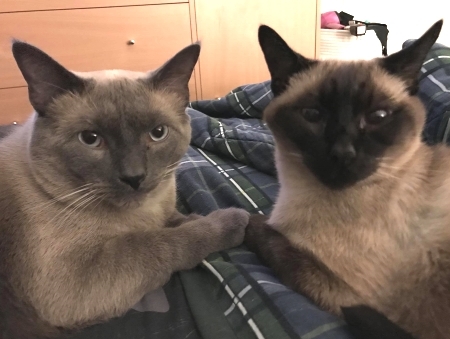 Our Meezers of the Month for September are, in keeping with our names theme, General Han Solo (left) and Princess Leia from Star Wars! Han and Leia have been regular visitors to our Facebook page and Princess Leia has recently undergone hernia surgery. It took her a few days to feel more like her normal self again and Han, who turned two years old a couple of weeks back, has been very attentive in keeping her company and gradually nursing her back to health. In September or October I usually order a wall calendar (or two!) for the following year. If you're like me and would like some ideas, why not hop over and take a look at our new Siamese cat calendars page? The page isn't quite finished yet, as there's one more calendar I'd like to add to it, but that one hasn't been published yet! 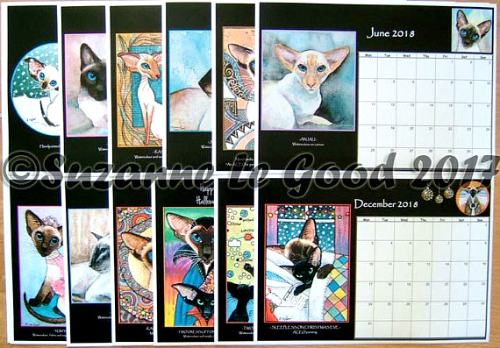 Meanwhile, if you'd like to get a little bit ahead of the game, we've got calendars from the Siamese Cat Rescue Center as well as from artists Suzanne Le Good, AmyLyn Bihrle and Eddie Kagimu. All very beautiful and a lovely way to brighten up your kitchen or office walls. That's all we've got time for this month, if I'm to get this out while it's still September! Thanks so much to everyone who wrote to me after last month's newsletter and sent good wishes for Bandit, who has had good days and bad days - although happily more good than bad, at the moment. I'm still working my way through replying to your messages but they've all been read, and very much appreciated. We'll be back towards the end of October and meanwhile, wherever you are, have a good month and hug your kitties tight!